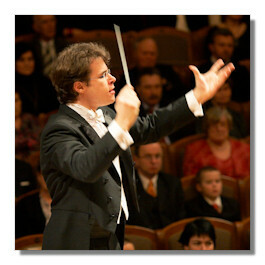 At only 33, Jakub Hrůa is a rising star among conductors. His achievements on disc have largely been centered around Czech music on smaller labels, so he's gotten little attention outside of the music crowd. But he's personable, dynamic, and very engaging on the podium. The Detroit Symphony Orchestra has been struggling to find a distinctive musical voice lately, and a conductor like Jakub Hrůa can sometimes be all a sagging ensemble needs to wake up. This proved to be the case. Charles Mackerras' work on behalf of Leo Janáček remains possibly his greatest gift to the musical world. The late conductor arranged this music and recorded it in definitive performances with orchestras as diverse as the Vienna Philharmonic. His Suite from "The Cunning Little Vixen" is a wonderful compilation of great tunes. While Hrůa is not yet Mackerras, he had the Detroit orchestra playing magnificently. Here at last, we have a conductor who can reign in and manage the oft-maligned brass section. Yes, there were still some odd sounds all around (especially from the horns) but the overall impression was very favorable. The Detroit forces had never played this work, but sounded comfortable and aptly virtuosic. Since polymath Stephen Hough fell ill, it was a real relief to see a star soloist available in the person of Jonathan Biss. Already an accomplished Beethoven pianist, Biss was remarkable in the Piano Concerto #4. In general, the last two movements fared best; there was some uncertainty in the first movement regarding tempos. That said, this was the most successful concerto collaboration I have heard in several months. It seems like I have to repeat myself endlessly, but in a perfect acoustic space like Detroit's Orchestra Hall, there is no excuse for a drowned out soloist. Both Music Director Leonard Slatkin and his various guests have all struggled with this, but Hrůa did not. Okay, so the strings were scaled down and there is very little brass, but I could hear every note! What a pleasure. The conductor crafted a swift and incisive framework for the slow movement (beautifully answered by Biss) and a wonderful final movement as well. The true pleasure of the evening was the Sibelius Symphony #3, a work that the orchestra had not played since 1993. It's a beautiful piece that gets overshadowed by the more overtly Romantic Symphonies #1 and #2. Still, there are some very memorable melodies (including a soaring brass line and a theme that sounds like it comes from The Lord of the Rings). I was thrilled to see that for the most part, Hrůa was able to keep the brass as part of the orchestral texture instead of letting them leap out of it at random. Continuing with the positive praise, this string sound recalled Slatkin's universally acclaimed Naxos Rachmaninoff cycle, which means it was pretty amazing. The orchestra's principal percussion also seemed far more comfortable after a few rough first weeks, and of course the woodwinds were typically fine. This was easily the best concert I've attended at the Hall since last autumn. Thank you, Maestro Hrůa!